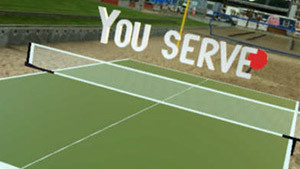 Table Tennis AR like its name suggests it's Table Tennis game realized using Augmented Reality technology. This game turns your phone into a paddle which you need to use to hit the ball. The table will be rendered on a flat surface in the place you currently in. It also features realistic physics and a multiplayer game mode where you can play against a local player or someone online. I knew some sort of a Ping Pong (Table Tennis) game will come to ARkit pretty soon. Table Tennis AR is exactly that type of game. I've seen Table Tennis game being brought to any digital medium and now it's time for Augmented Reality to get its own version of this popular sports game. If I am not mistaken this is the first Table Tennis game for AR. 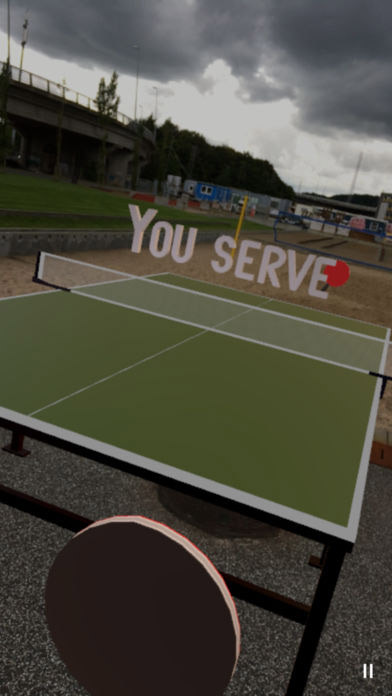 Table Tennis AR put a focus on fun and immersive AR experience. You can play against a smart AI opponent or play in the multiplayer mode where you can challenge a friend locally or online against other players from all around the world. You probably wonder how exactly you can play a Ping-Pong game in AR? Like, where it the paddle? Well, your iPhone is the paddle. The camera is fixed behind the paddle so you can position the paddle so you can both hit the ball and see the area in front of you. Of course, it was better if the field of view wasn't restricted to the position of the paddle (the iPhone or iPad) location. This is why in some way, playing a Table Tennis game is kind of ristricting in AR. The idea that camera could be controlled freely by the player and objects won't be attached to the camera, maybe only for a short time to control objects. This is why, in my opinion, Table Tennis plays best in VR, rather than in Augmented Reality. Having said that, it's kind of cool knowing that you can just spawn a virtual Table Tennis table everywhere you go and just play for fun. Of course, because of those limitations, you can't just land an above head hit because you just lose your field of view, you won't be able to look at the screen and still make that shot. The iPhone or iPad's screen is your window to the augmented reality world, and this is why Table Tennis AR can't really bring you the same exact physical world gameplay experience. The same goes to the rotation of the table tennis racket. You play it with the racket straight up and just need to position your phone to it can hit the incoming ball. I can now understand why Microsoft went with glasses design for its HoloLens. This way, the camera is fixed to your field of view and you can use a controller accessory, which in this case can serve as the racket. Of course, HoloLens for many people is still not a reality, and ARKit is here and now. Having said all that, it still a great ARKit game. It got online leaderboard and offer the ability to reposition the table so you can play it in the most comfortable way. I think it's well worth the price, so don't forget to check this game out if you own an ARKit iOS 11 supported iPhone or iPad device.